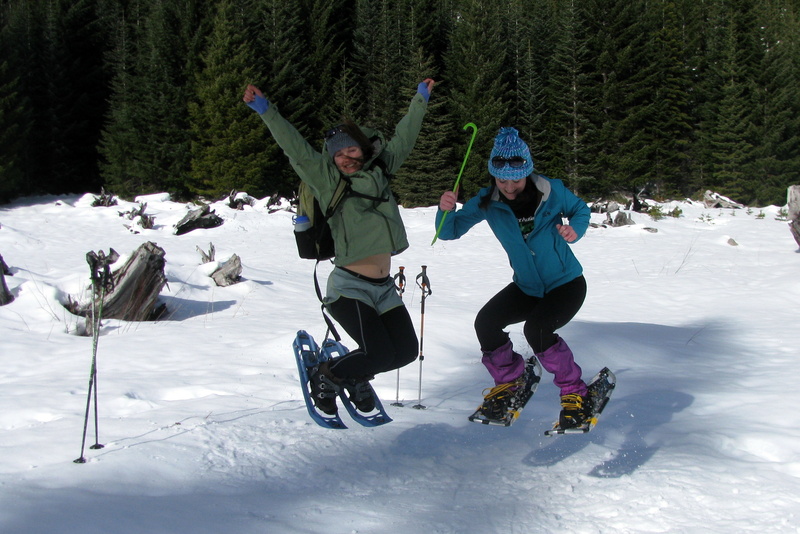 With each step a high-decibel crunch erupted against the crusted white snow, drowning out the winter silence in the central Oregon Cascades like a rolling freight train – but our laughter sounded louder. This past weekend I headed east along highway 58 into the Cascades from Eugene to spend the day playing in the snow. Stopping at the Mercantile in Oakridge, which carries snowshoes and cross-country skis during the winter season, we picked up some winter gear and continued to Salt Creek SnoPark. Salt Creek SnoPark offers various snow trails through the beautiful evergreen forest, a sledding area near the packing lot and of course the highlight of this stop, Salt Creek Falls – the second highest waterfall in Oregon. During the summer, Salt Creek Falls, is accessible from an upper parking lot via a short maintained trail; yet come the first snow dump of the season, the trail to the road is a little more adventurous. Trekking with our snowshoes we experienced the beautiful cascade of the falls surrounded by the white snow and ice. You can make it to the falls without snowshoes if the snow is packed, but be prepared to have wet, cold feet. A Oregon SnoPark Permit is required to park. Besides just seeing the falls, we also wandered several different trails for a total of about four hours and even spotted Diamond Peak dusted in white and silhouetted by trees. Along for this winter adventure – my neon green shoehorn! Check out the video below (the first video I’ve ever made) and see if you can spot the shoehorn in the snow! Mentioned it on Twitter, but I liked this post. Always wanted to do some snowshoeing and learn X-country skiing. Maybe I should live in Oregon! Awesome video! I’ll be snowshoeing and hopefully making my own video tomorrow from my neck of he woods. That waterfall was particularly sweet! Awesome. I’d love to see the video from your trip! Looks like it was gorgeous. Love the snowshoe jump! We love this trek in the winter. Salt Creek Falls and Diamond Creek Falls are fun to explore. Thanks for sharing!